LATEST FIVE TYPES OF SPICES IN VEGETABLE FRIED RICE. 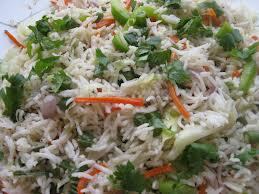 Home » lifestyle » LATEST FIVE TYPES OF SPICES IN VEGETABLE FRIED RICE. 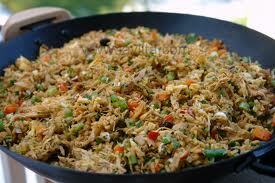 The new type of five spices vegetable fried rice contain through Jain people. It takes 20 minutes for preparation and 15 minutes for cooking. The ingredients used for the fried rice are three cups cooked rice, half cup sliced coloured capsicum i.e; green, yellow and red, one fourth of shredded cabbage and sliced babycorn, two tbsp of chopped celery, two tsp of Chinese five spices powder contains one fenne seeds, half cloves, one cinnamon, two star anise, two schezuan peppers. Make a powder and keep aside, half tsp of soy sauce, one tsp chilli sauce, two tbsp oil and salt to taste. Take a pan heat the oil, combine all types of vegetables and allow it to cook for 2 minutes. Now add rice, five spice powder, soy sauce, chilli sauce and salt. Mix it well and another 5 minutes cook it nicely. Now the delicious and tasty five spices vegetable fried rice ready colorfully. Finally, for garnishing purpose add coriander leaves at the top.